How to restore your MS SQL 2008 database from a previous backup. Restoring your MS SQL 2008 database from a previous backup will restore all of your Enterprise TV configuration settings, and recording jobs. NOTE: If you are using Enterprise TV 5 in a clustering configuration, it is only necessary to restore the database that resides on the Master Node. You will want to temporarily stop our SnapStream Broker from running. Right-click "SnapStream Broker", and select "Stop". NOTE: You must be signed in to the server as a system administrator in order to connect here. Click the plus next to Databases, and right-click "SnapStreamTV". Go to Tasks > Restore > Database. When the Restore Database window comes up, select "Options" on the left hand side of the screen. 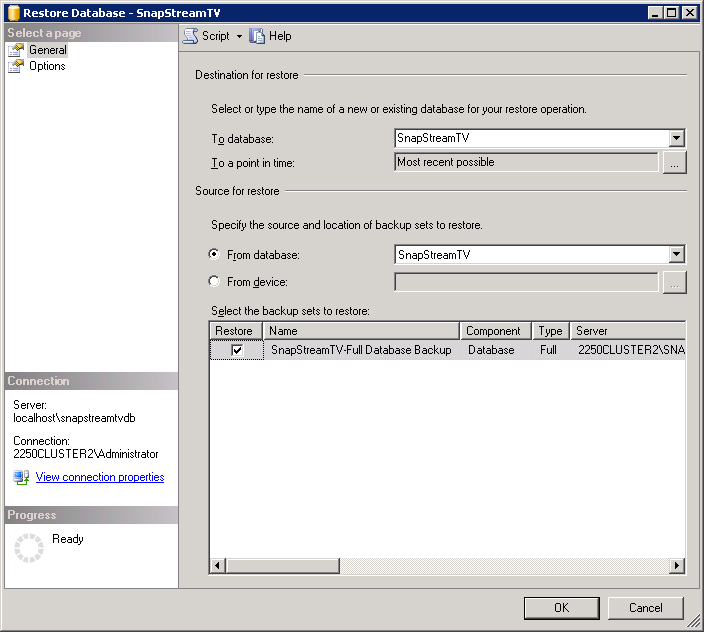 Here you want to check off the option for "Overwrite the existing database (WITH REPLACE)". Now select "General" on the left hand side of the screen. 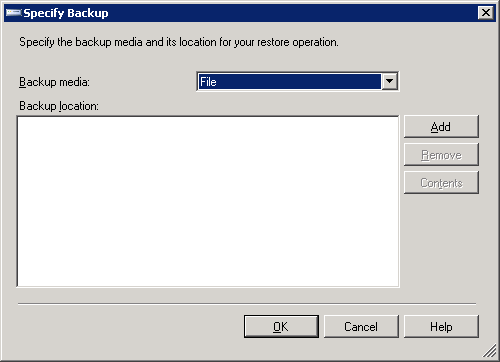 This is where we need to specify the location of the backup that we are restoring. 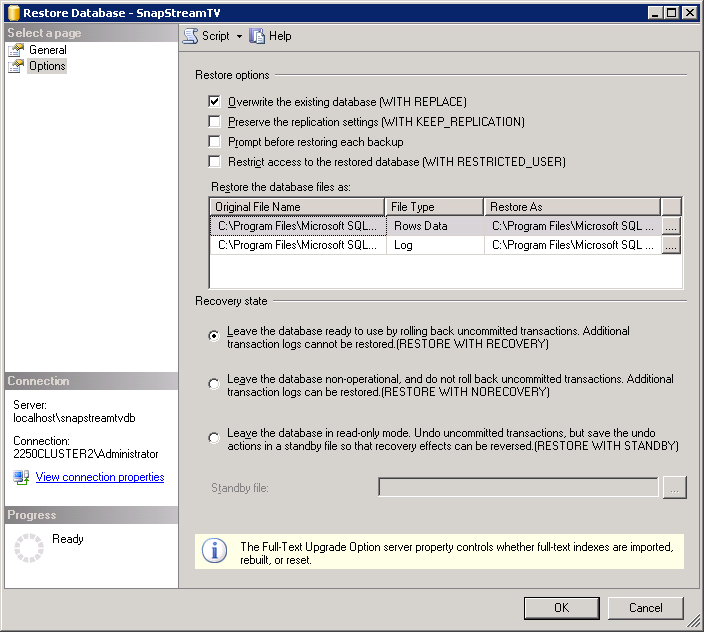 NOTE: If your backups have been saved to the default location, the path should already be selected for you. Skip to step 9 if this is the case. 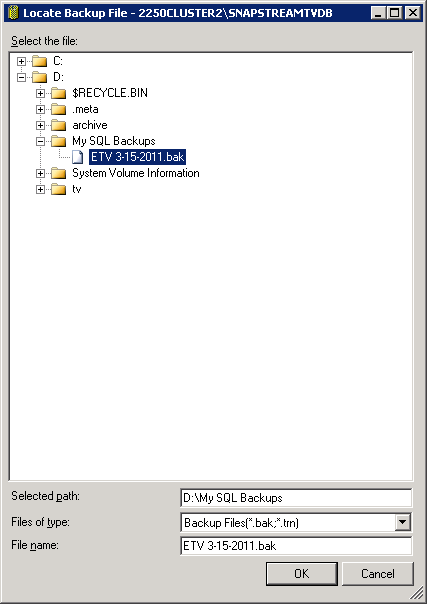 Select "From device", and click the button with three dots to specify the location of your backup up database. Backup Media should stay at "File". Now click the Add button to browse to your backup file. NOTE: You will not be able to browse to your backup here if this backup doesn't have the .bak extension. You can rename your backup file to include this extension if it doesn't have it already. You should now be back at the Restore Database window. 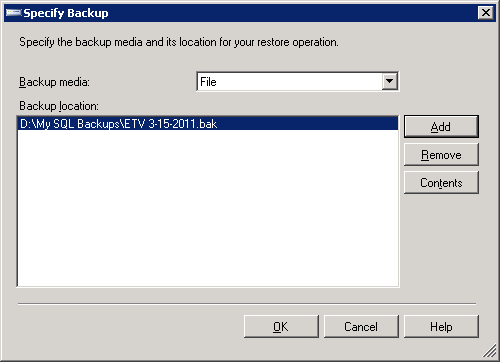 Make sure that you have checked off the restore box for your backup and click OK.
Click OK, and the backup will start. Once you see the message below, your backup is complete. Click OK and close the Restore dialog window. 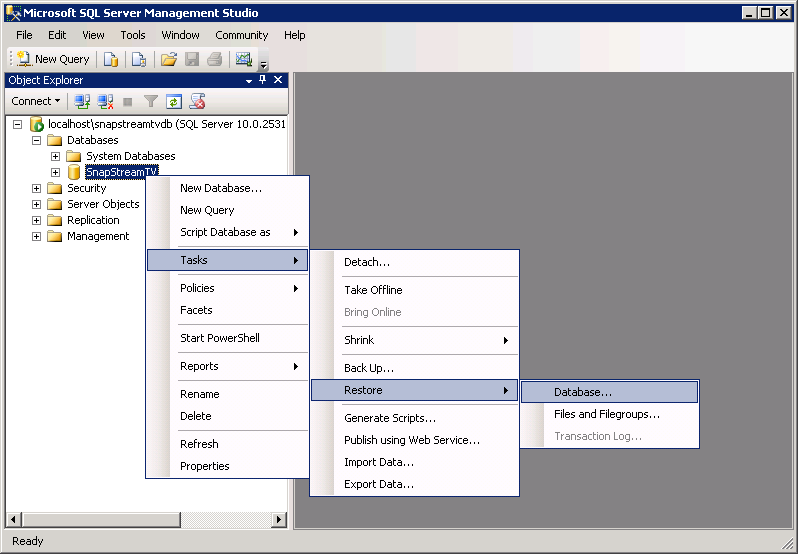 Copy the contents of the text file into the New Query box. Hit F5 to execute the query. You should see several lines of black text in the Messages box. You can now start the SnapStream Broker service back up. 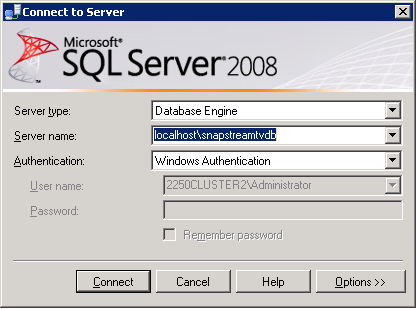 Right-click "SnapStream Broker", and select "Start".